Every essential oil contains many different natural chemical compounds (sometimes hundreds), which are responsible for the effects of that oil on your mind and body. Each oil therefore has a vast array of properties, depending on its constituents. Some physical properties of essential oils include pain relieving, anti-inflammatory, digestive, decongestant, antibacterial and antiviral, to name just a few. Some psychological properties include stimulant, sedative, antidepressant and anxiety-relieving. Firstly, we have a thorough consultation, to work out what is going on for you physically and emotionally. I often find that seemingly unrelated issues may be linked. For example, you may tell me that you have been feeling bloated and constipated for several weeks, which corresponds with a stressful event at work. An apparent digestive complaint may thus be triggered by your response to stress, which comes from your nervous system, which is known to stop digestion in its tracks. Aromatherapy seeks to address the cause of your complaint holistically, rather than just treating the symptoms. I therefore choose a unique blend of oils, to address as many of your presenting issues as possible. As you tell me about your health and your life, I build up a picture of you as a whole. I often find that one or two oils will stand out in my mind, because they have a range of properties which seem to fit the bill exactly. It can almost feel as if an oil or several oils have your name on them, like when you see something in a shop and immediately want to buy it. I love coming up with new aromatherapy prescriptions for complex medical conditions. If you have a condition which has no known aromatherapy remedy, then I shall find out as much as I can about the causes, symptoms and medical treatment, to work out the best oil blend for you. This is why I ask you to fill in the online consultation form before I see you. It gives me a head start in preparing for your treatment and doing some valuable research before you arrive. However, I only make a final decision about your oils when I actually see you. Your aromatherapy treatment is therefore much more than a blend of fragrant oils. I use my academic research skills and intuition to give you a truly holistic treatment. I do not use any predetermined massage routines for my aromatherapy treatments. Instead, I combine aromatherapy with therapeutic, sports and deep tissue massage and myofascial release, to give you a truly unique and tailored treatment. The oils are absorbed by your skin during your massage. They also enter your lungs as you breathe in the beautiful aroma. Your skin and lungs have many tiny blood vessels, so the essential oil vapours can enter your bloodstream via your skin and lungs. The amounts which you actually absorb are very small: enough to do you good and not enough to cause harm. This is why aromatherapy is a very safe and gentle treatment. Aromatherapy is most effective when you use the oils regularly, so that you receive ongoing doses of essential oils into your bloodstream. This can be likened to our diet. We need regular nutritious food in order to stay healthy, not just the occasional healthy meal. Essential oils can help to relieve muscular aches and tension, leaving you more mobile. Some are cooling and others are warming, so which ones I use will depend on how your muscles are feeling and why. It is therefore easy to see how aromatherapy complements massage so well and makes it even more effective. Many essential oils have specific benefits for different body systems. Some may help to clear the lungs, so that you can breathe more easily. Others are warming and help to maintain healthy blood and lymph flow. Yet others are cleansing and may help to keep your digestion moving, in conjunction with a healthy diet. Essential oils can be supportive for women at all times of life, to help manage the challenges associated with the menstrual cycle, pregnancy, childbirth and the menopause. Aromatherapy oils and creams can be wonderfully soothing and help to maintain healthy skin. I have personal experience of this. As a teenager, I suffered from facial acne and my GP prescribed an aggressive cream, which bleached my skin and stopped me from getting a sun tan. I felt utterly miserable about my skin until my twenties, when I discovered aromatherapy skin care products. These cleared up my skin, without the nasty side effects, making me look and feel good again. I still use aromatherapy skin products and often make these for myself. People do not always believe me when I tell them that I do not wear makeup! This is the best kind of beauty therapy: when your skin is so naturally beautiful and healthy that you do not feel the need to change its appearance. On a psychological level, essential oils can help you to manage the symptoms of everyday stress. They may aid relaxation, improve your sleep and enhance your mood and sense of well-being. For long-term treatment and lasting benefits, I can offer you a prescription oil blend to use in-between your aromatherapy massage treatments. This is an indulgent and effective way to give yourself some me-time at home, helping you to get better faster. If you are not keen on having massages, but are still interested in using aromatherapy at home, I can support you with this and make up your prescriptions, so please ask. The type of aromatherapy product which I offer you will depend on your situation and how you will be using it. If you are treating your skin directly, I will give you an oil, cream, lotion or spray. If you wish to luxuriate in a relaxing aromatherapy bath, then lotion or bath foam works best. If we think that it will be most beneficial for you to inhale the oils directly from a tissue or diffuser, I shall make you a neat essential oil blend. Please note: if we decide to go ahead with a home treatment product, I shall make this up in time for you to collect at your next appointment, or at a time otherwise agreed. This is a complex subject and I cannot do it justice in a few paragraphs. If your appetite has been whetted and you want to understand aromatherapy in more technical detail, please read on. This is something of a misnomer, since essential oils are not actually “oils” at all. They are the whole, unadulterated, volatile essences of plants. ‘Unadulterated’ means that nothing is added and nothing is removed, as nature intended. They are extracted from plant material either by distillation or mechanical expression (high-tech squeezing). Each essential oil contains many different chemical compounds (sometimes hundreds), which are responsible for its properties. All of these compounds are made up of the same building blocks: carbon, hydrogen and oxygen. The relationship between the compounds in essential oils and their effects is complex though. When dealing with a hormone or a drug, it is relatively straightforward for chemists to attribute an effect on the body or mind to one or two chemical compounds, which have been isolated and studied. However, research shows that the properties of essential oils often result from interactions between their constituent compounds, rather than one compound alone. For example, when scientists try to isolate the main active ingredient of an essential oil known for its antibacterial properties, they often find that this ingredient alone is nowhere near as effective as the whole oil, when it comes to wiping out bacteria on an agar plate. Equally however, the other minor ingredients within the oil are not especially antibacterial either. The concept of compounds within an oil working together is known as synergy. The whole effect of an oil is thus greater than the sum of its parts. Even with advanced modern chemical testing, we cannot identify 100% of an oil’s makeup and there are always traces of substances unaccounted for, which may be contributing to its effects. It is therefore not possible to make an exact copy of an essential oil in the lab and attempts to do so never give the same therapeutic effects. 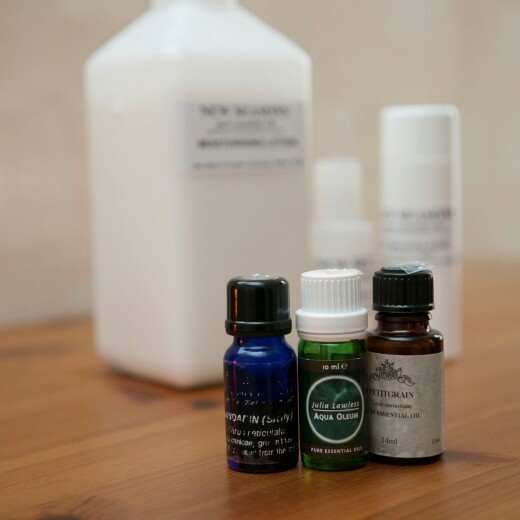 Essential oils are highly concentrated and are therefore not normally applied neat to the skin. For the purposes of massage, we blend them with one or more vegetable carrier oils. How do Essential Oils Enter your Bloodstream? A small amount of essential oil enters your bloodstream via your skin, during a massage or when using a cream or lotion. Essential oils are chemically attracted to fats, so they are drawn to your skin, which is naturally oily. The essential oil molecules are so tiny that they are absorbed by the sweat glands and hair follicles in your skin. They reach your bloodstream via the blood vessels in the lower layers of your skin, the dermis. The fastest way for you to absorb essential oils is via your lungs when you inhale the vapours. The linings of your lungs have a large thin surface with tiny blood vessels, for gases to pass into and out from the bloodstream. Inhalation also triggers a complex nervous response, when your nose detects a smell and sends signals to your brain. This causes neurotransmitters (nerve messenger chemicals) to be released in your brain, which are responsible for your mood and emotional responses. Your individual response to a specific smell will depend partly on which types of smell receptors you have in your nose and partly on your memories associated with the smell. A smell which you associate with your mother or with a garden in summer may be comforting and relaxing. On the other hand, a smell which you associate with an unpleasant experience, or someone who frightened or upset you may leave you feeling depressed or panicky. This is why it is essential that you like the smell of your aromatherapy treatment oil. These are true oils: liquid fats, with a greasy texture. They contain a wide range of fatty acids, vitamins and minerals, which are extremely nourishing for the skin. However, unlike essential oils, most carrier oils do not penetrate beyond the skin and therefore do not enter the bloodstream. Many carrier oils have their own therapeutic properties, especially for your skin. I therefore select these for you as carefully as I select your essential oils. My thanks go to Penny Price and her team at the Penny Price Academy of Aromatherapy for their vast knowledge, skills and expertise in this fascinating subject. I would also like to thank Penny’s parents, Shirley and Len Price, whom I have had the privilege of meeting personally. Shirley and Len have trained and inspired many aromatherapists worldwide and have been instrumental in developing the modern study of clinical aromatherapy in the UK. In their retirement, they continue to act as consultants for Penny Price Aromatherapy. BV, artist: Emotionally I feel a lot more at peace within myself than I did before starting the aromatherapy and massage, and that I have more resources and feel a bit more in control.